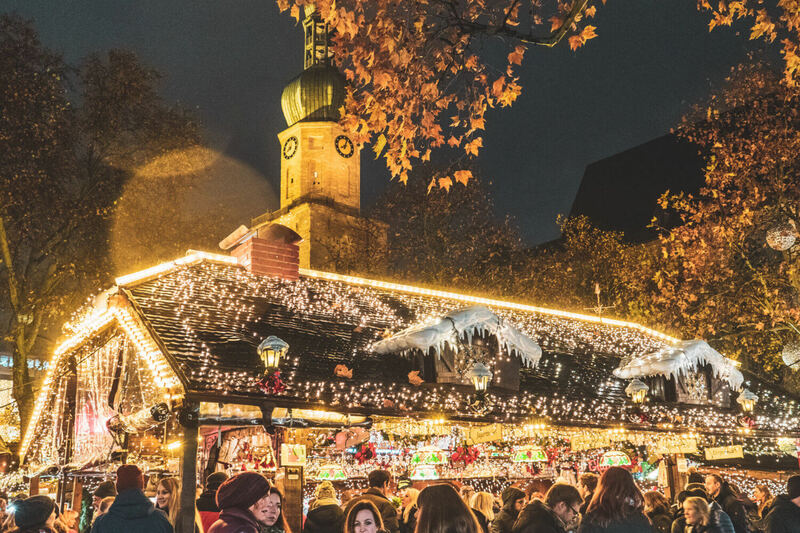 Düsseldorf Christmas Markets Guide 2019: Where to Go, What to Eat & More! 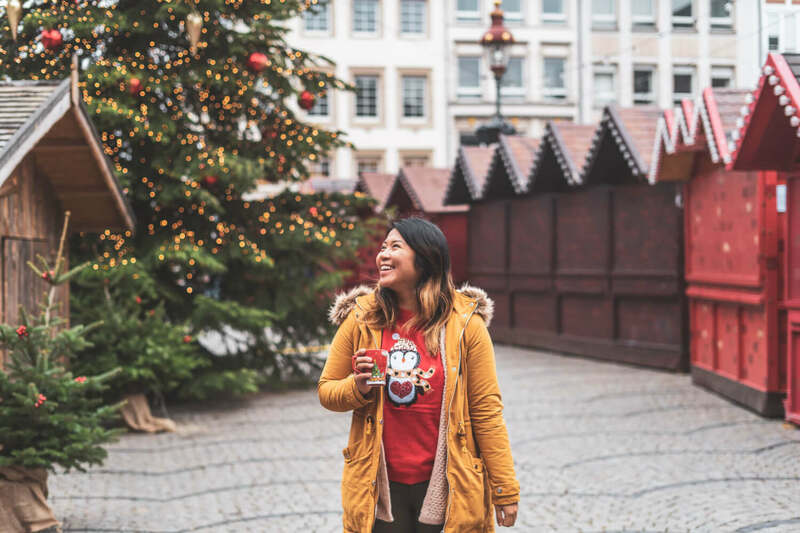 It may have been the ten buckets of Glühwein I eagerly chugged, but my friends, I just had the best weekend ever exploring the Düsseldorf Christmas Markets scene, and I’m here to rave about it like your favourite drunk uncle. Düsseldorf at Christmas time looks like this: cozy, themed markets scattered along the streets of Germany’s fashion capital, complete with twinkling lights, a big ice rink, a giant ferris wheel overlooking the Rhine, and yes, a Lindt chocolate store that’s liberal with free samples. But what truly set these markets apart is this: Düsseldorf is located in the North Rhine-Westphalia state of Germany, close to several other large cities like Essen, Dortmund, Duisburg and more. ALL these cities have amazing Christmas markets, and are easily linked to each other through public transportation. 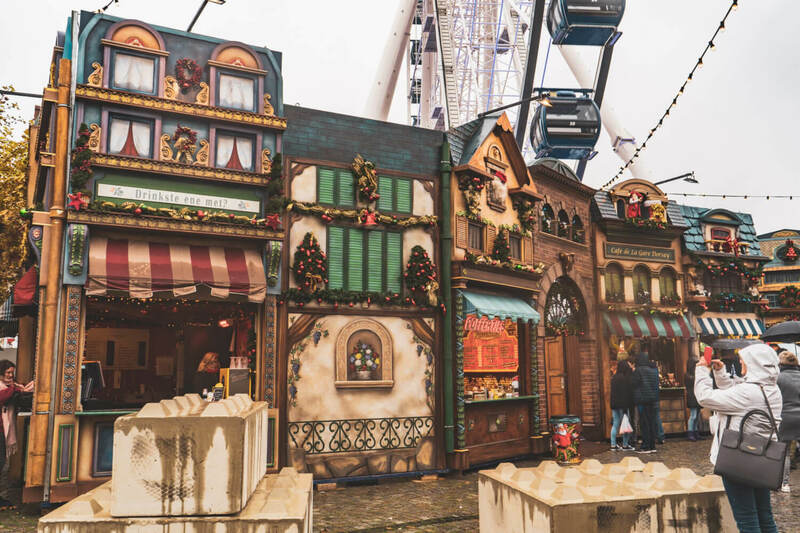 What’s more wonderful is that the Christmas markets here open earlier than most other parts of Germany, including the one in Duisburg, the country’s longest-running market, which opens in MID-NOVEMBER. … And so, I did what any sane Christmas addict would do: I spent a weekend exploring them ALL. Yes. All of them. Including the seven within Düsseldorf’s city center. So, where are the Christmas markets in Düsseldorf? When do Christmas markets start in Düsseldorf? Any more questions about Düsseldorf Christmas Markets? Düsseldorf is a pretty big city, but there are seven main Christmas markets all located in the city center, near the Altstadt (Old Town) area. 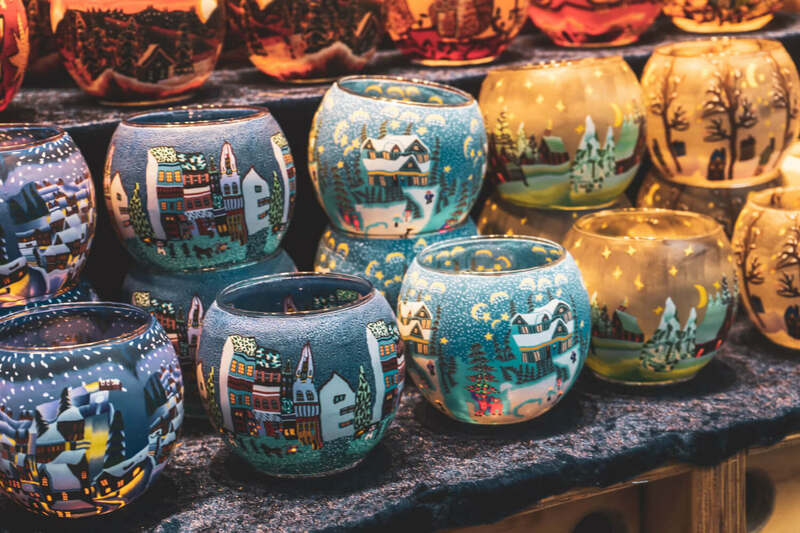 If you want to go further afield, there are plenty of Christmas markets to visit between Benrath and Kaiserswerth as well. You can find a full list on the last page of the official Düsseldorf Christmas brochure here. Of course, you can also do like me and take advantage of a North Rhine Westphalia regional ticket (a SchönerTagTicket NRW ticket) and enjoy unlimited transport in the region for a day. I used this with my boyfriend to hop between cities in the region, which allowed us (in one day) to see the largest Christmas tree in the world in Dortmund, the longest-running Christmas market in Duisburg and also the supremely underrated Christmas Market in Essen. I highly recommend doing this and will be detailing some nearby must-see Christmas markets near Düsseldorf later! One of the best things about the Düsseldorf Xmas market scene is that the markets in this region open a few days earlier than in other parts of Germany! In 2018 for example, the main market in Munich didn’t open until the 27th, whereas the ones in Düsseldorf were open from the 22nd onwards. This was primarily the reason I picked it for my getaway. Because I’ll be spending Christmas at home this year, I wanted to cram in as much magical German goodness before my departure. So, if you’re wondering when the Düsseldorf Christmas Markets will be open, here are some key dates/times for you. 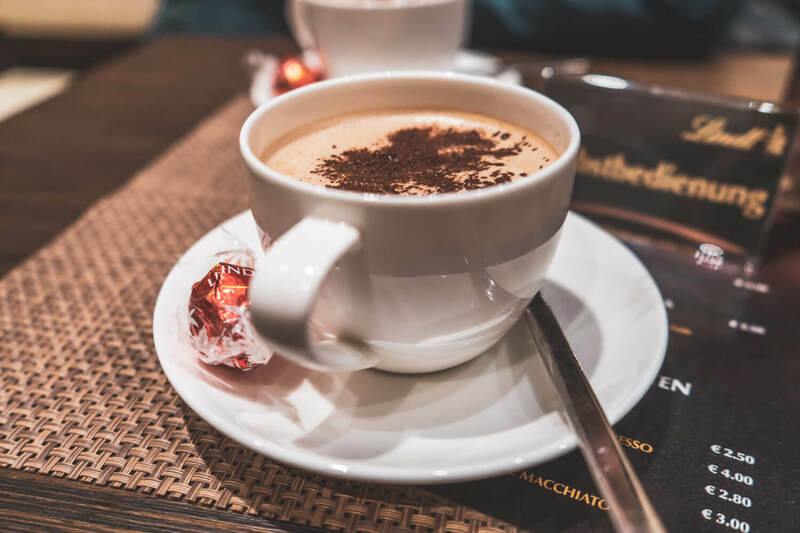 Because all the markets are located in the Düsseldorf city centre, pretty much any hotel you book in the centre will put you within easy distance of the markets themselves. 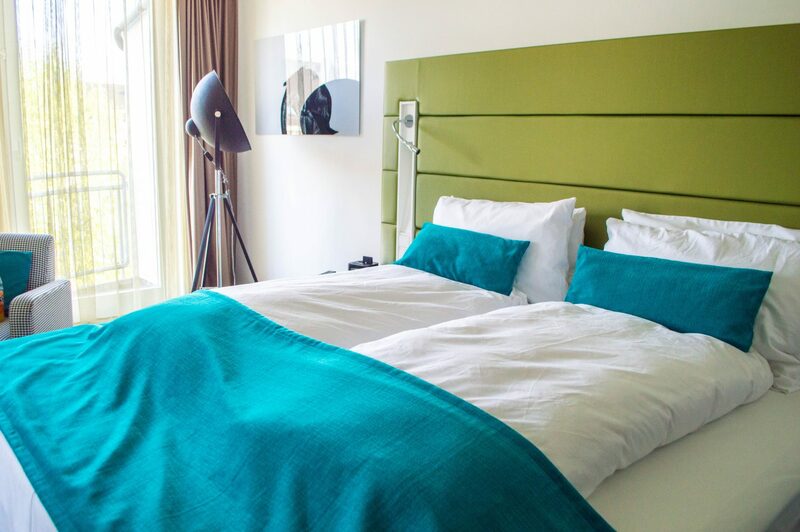 For a great, mid-range hotel a little out of the center: If your goal is to balance cost/comfort, then I can highly recommend the Hotel Indigo Düsseldorf. It’s a clean, airy and super-modern hotel that’s not quite in the Old Town but about 20 minutes’ walk from most of the Christmas markets. I stayed here a while back and loved it (full review here). For a budget choice near the train station: If you want something very very cheap but still clean, then the Hotel Famosa might be for you. It’s within a 10 minute walk of the train station/ the start of the markets/shopping area and it’s very close to a LOT of great Japanese restaurants. It’s definitely a little run-down, and the street it’s on can feel a little sketchy, but for the price (less than 60 euros a night! ), the rooms themselves are very clean and the staff are friendly. It’s not a glam place by any means but a great compromise between price/location. Alright, now let’s get to the good stuff: the specific markets. As I mentioned before, in Düsseldorf’s city centre, there are 7 different Christmas markets scattered around within close skipping distance within each other. In the name of research, I ate my way through most of them this past weekend, so I’d love to share a detailed breakdown of the different markets, themes and vibes with you. NOTE: It’s very easy to hit each of these Christmas markets in a few hours, so I highly recommend you try to see as many as possible! While many will have similar stalls and products, they do have unique themes/designs so they’re worth a look. I could have easily seen them all, but my sense of direction failed me and I managed to miss one. Don’t worry – I’m still kicking myself over it. 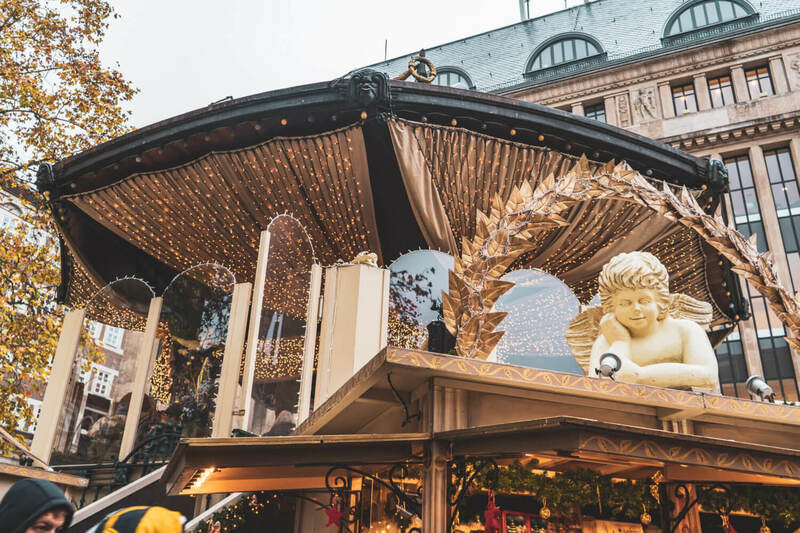 The Engelchen-Markt (little angel’s market) in Heinrich-Heine-Platz is solid proof that great things come in small packages (and that there’s no such thing as too much gold or sparkles). While quite a tiny market, this atmospheric gem is (in my opinion) the best Christmas market in Düsseldorf. 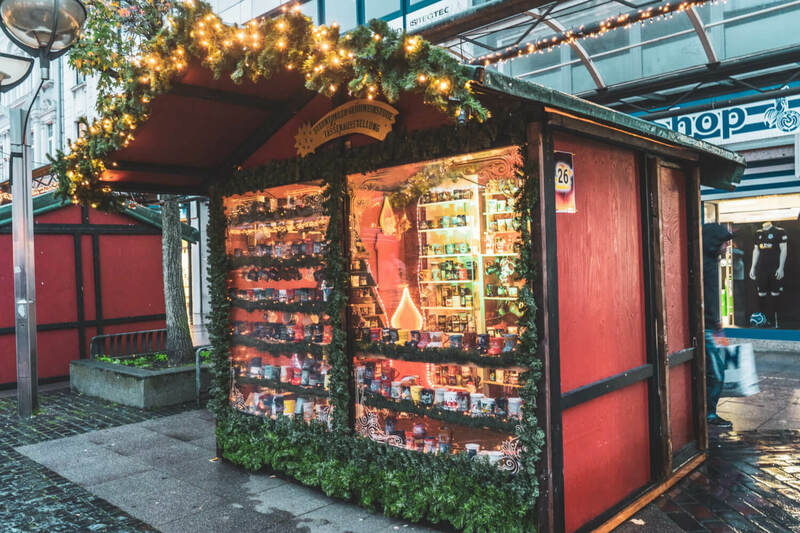 From delicious Aachen Printen to handcrafted slippers and rainbow tins of tea, you can find all sorts of goodies at these golden, angel-topped stalls. The music pavilion in the center serves as a gorgeous little centerpiece (and of course, makes an excellent place to sip ten litres of glühwein). It’s cuter when you make it rhyme -> Drink til oblivion in the pavilion. 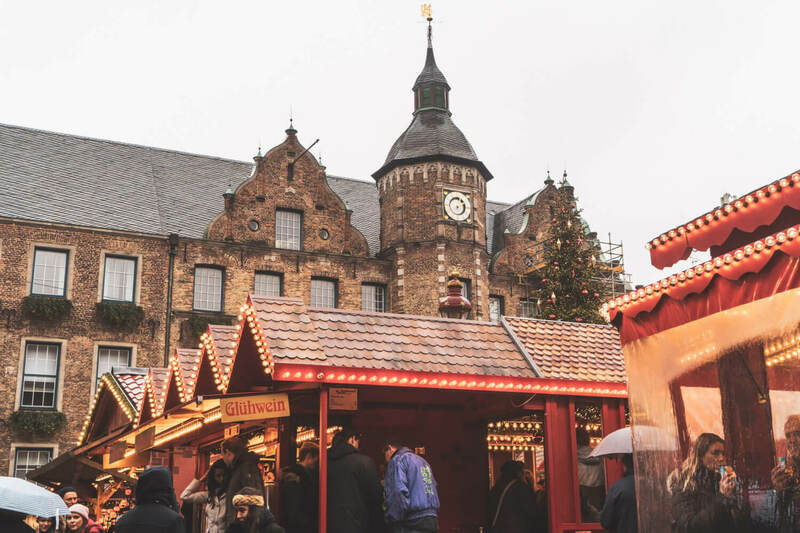 Set along the scenic backdrop of Düsseldorf’s Rathaus (City Hall), the Handwerker-Markt in Marktplatz is like a cutesy little Christmas village, complete with a tall glittering tree and red Christmas huts selling all sorts of handicrafts. Here, you can take your pick from dozens of stalls selling handmade items – like burly, wooden kitchenware and handpainted candle holders. The hand-carved life-sized Nativity scene here is also noteworthy, although I didn’t get the closest look thanks to the eager photo snappers in front of it! Vegans take note, I also noticed a sweet stall selling all kinds of vegan and gluten-free treats, including cannolis, fudge, pralines and more. If you’re looking for a place to indulge, this is it! While walking between Marktplatz and Heinrich-Heine-Platz (the two markets mentioned above), you’ll find a variety of cute Christmas stalls scattered along Flinger Straße. With a picture-perfect backdrop of the Old Town’s colourful facades, the stalls themselves are painted like Düsseldorf burgher houses which yes, I can confirm, is irritatingly cute. There are plenty of stalls to peruse and grab goodies at along this street, but there was one stall in particular that I loved which sold stunning handmade ornaments, and of course I couldn’t resist buying one for home. Keep an eye out for it – the ornaments are made of pinecones and other beautiful earthy things (sorry – I’m not a botanist). PS: Along the way, you’ll also encounter a big Christmas pyramid selling mulled wine. While here, keep an eye on the peculiar figures rotating around, who don’t look at all like traditional Christmas figures. I thought there was something weird about them at first glance and sure enough, after a quick Google, I found out the spinning figurines in this pyramid are actually important Düsseldorf public figures, including “Mutter Ey” a woman who used to own a coffee kiosk near the art school. How random, but cool. Keep an eye on the figures on the middle level! Branded as the “fairytale market” this year, with huts topped with characters from the Grimm’s Brother fairytales, this is the one Düsseldorf Christmas Market I missed this year, simply because of my poor sense of direction. I was probably walking directly parallel to it, and didn’t even realize. It’s a shame, because it looks absolutely magical! There’s apparently even a Christmas Tower where stories are read out loud and the kiddos (old and young) can meet Father Christmas for themselves on Fridays. The word “Markt” here is a little misleading here because the Schadow-Markt isn’t so much a contained market as it is just a line of stalls along one of Düsseldorf’s main shopping streets. That said, the Schadow-Markt is still a nice addition to your Düsseldorf shopping adventure (just don’t expect a cozy winter wonderland vibe). 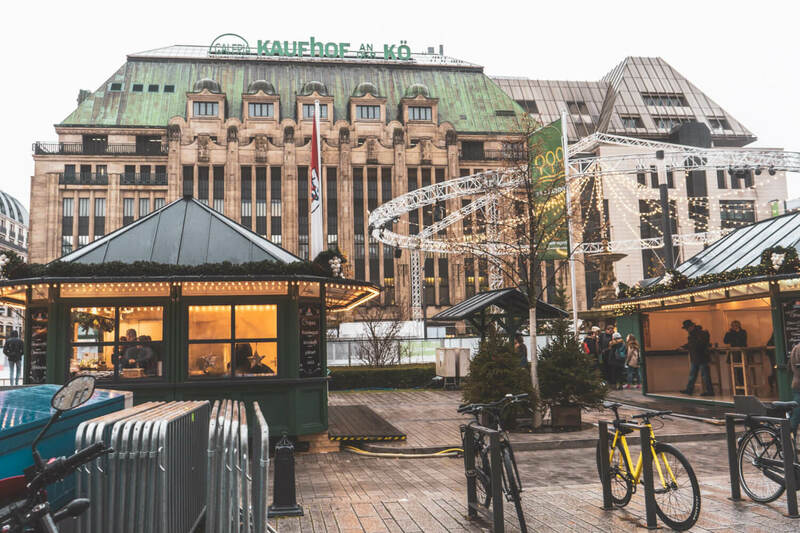 Why not supplement your shopping at big-box retailers like Karstadt with some lovely Christmas market stalls….? Or just take a break with a hot mug of glühwein and rest your feet after battling with pre-teens over discounted pyjamas at Primark! 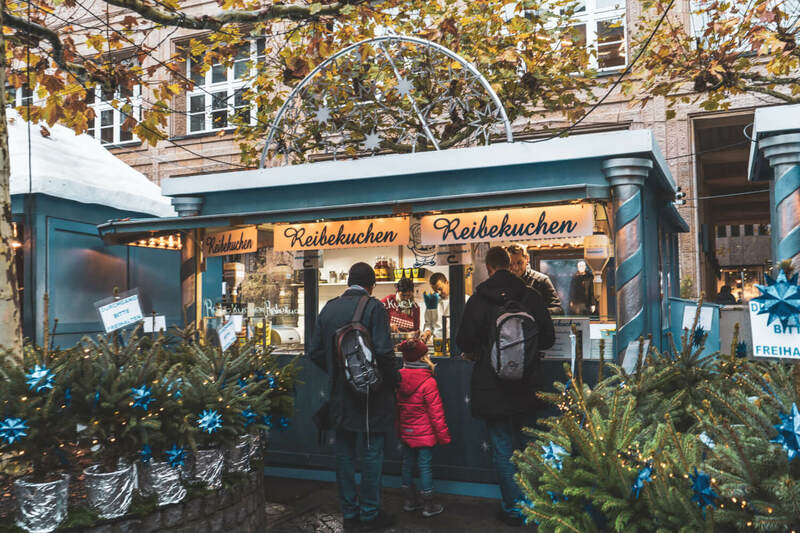 With a scenic location overlooking Hofgarten, this Düsseldorf market is a must, especially if you have young ones in tow. Alongside pretty wooden huts selling the usual goods, there’s a special childrens’ activity tent and a hut filling the air with the tantalizing (yet stinky) smell of raclette. If you’re on the hunt for live music as well. the Lichterhimmel at this market is where a variety of live musical performances will take place throughout the season. You can find the live music program here. 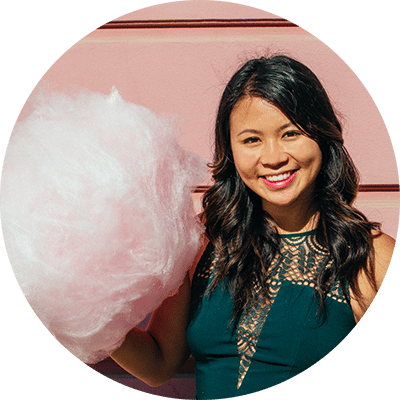 Yay – now let’s move onto some other nearby markets you can visit. As I said earlier, one of the best things about visiting Düsseldorf for Christmas markets is that you are within easy travelling distance to plenty of other amazing Christmas markets in the rregion. We devoted a day to exploring a few different nearby cities and are so glad we did. You can definitely say we got our fill of Christmas! Anyways, all of the following are less than an hour away from Düsseldorf by train. These are (in my opinion) some of the best Christmas markets near Düsseldorf, and easily accessible when you’re basing your little vacation from Düsseldorf. PS: If you plan to visit many cities in a day, I recommend getting the North Rhine Westphalia regional ticket (a SchönerTagTicket NRW ticket) to enjoy unlimited transport in the region for a day OR you can also get a Verkehrsverbund Rhein-Ruhr 24/48 hours ticket which is cheaper but more limited in what trains you’re allowed to take. Honestly, my favourite Christmas markets I saw this trip were in Essen. The lighting displays here were the best I saw in the region, both in the main market (pictured below) and in the streets. Their main market is also international-themed, which means a nicer diversity of products on offer. Last but not least, they have a small medieval market in addition to the standard traditional one, which sells cool things like leather coin pouches and wooden treasure chests! You can read a full post about the market here. How to reach the Essen Christmas Markets from Düsseldorf: The trip from Düsseldorf Central Station to Essen Central Station will take about half an hour and from there, you can reach the main Essen Christmas markets on foot within 10 minutes (with stalls greeting you immediately when you exit the station, actually!). You can easily check timetables on GoEuro or the DB website, but trains are very frequent. Branded as the “longest Christmas market in Germany”, the Duisburg Christmas market makes my list simply because it’s much quieter and less congested than the Christmas markets in Düsseldorf. 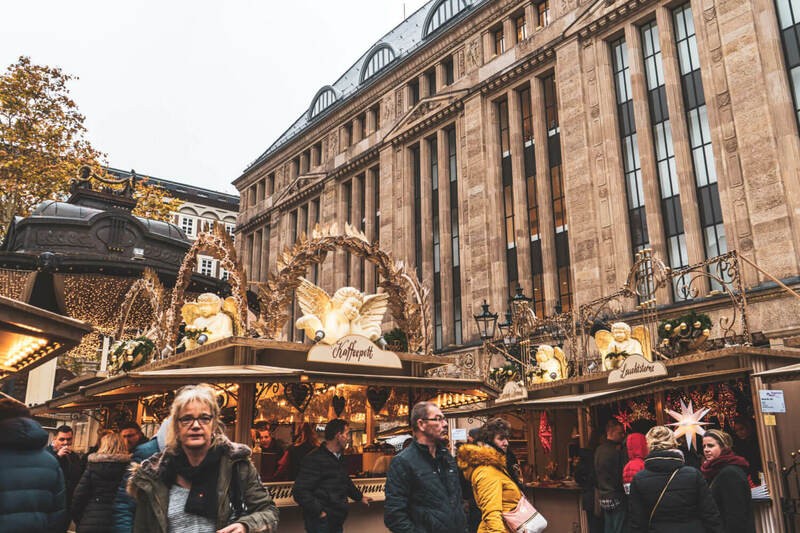 The market opens far earlier than most Christmas markets in Germany (around mid-November), which might explain its relative airiness and lack of crowds. A few highlights for me included the Zum Faschen stall near the beginning of the market, a wooden chalet house with a cute outdoor seating area in the back with a cozy fire and little barrels you can sit in. There was also a very cute display stall right in front of “Zebra Shop” that showcased hundreds of adorable Christmas market mugs from different years and cities around Germany. 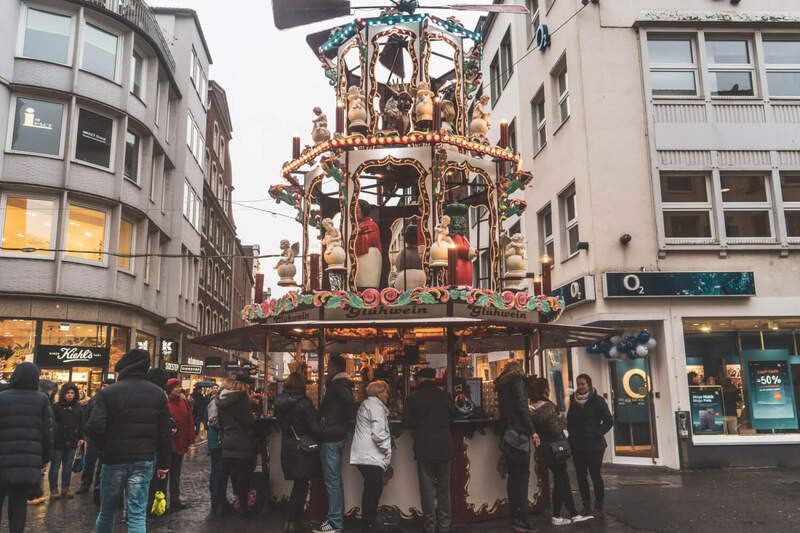 How to reach the Duisburg Christmas Market from Düsseldorf: The trip from Düsseldorf Central Station to Duisburg Station will take about 15 minutes and from there, you can reach the Duisburg Christmas market on foot within 10 minutes. You can easily check timetables on GoEuro or the DB website, but trains are very frequent. The Dortmund Christmas Market is world famous because of its giant tree, which happens to be the largest Christmas tree in the entire world! 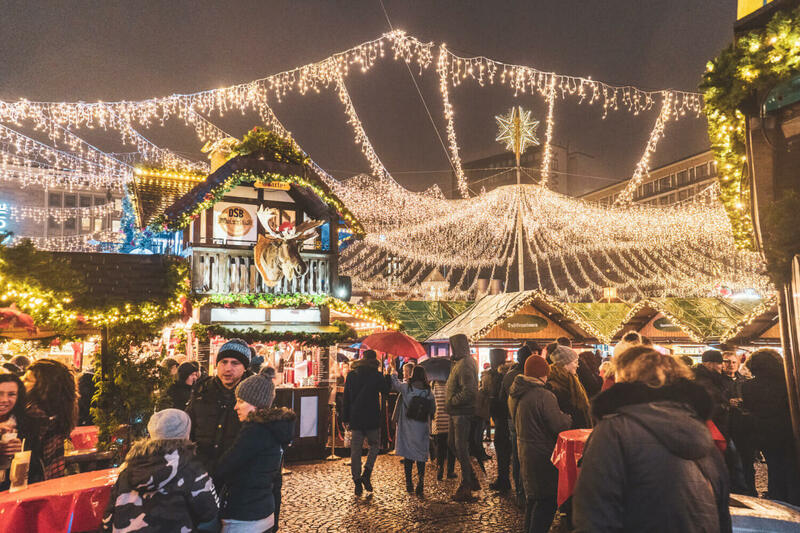 Alongside its status as one of the largest Christmas markets in the country, this naturally makes it one of the best Christmas markets near Düsseldorf to visit. Besides the truly humongous tree in Hansaplatz (which isn’t lit up until November 26, mind you *shakes fist*), there are also a lot of other stalls and little markets scattered around the city, and a fun little ferris wheel you can ride. 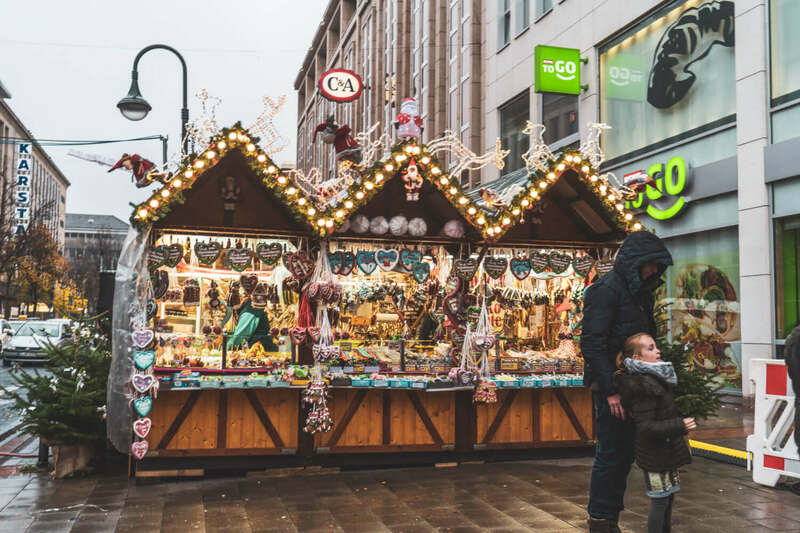 How to reach the Dortmund Christmas Market from Düsseldorf: The trip from Düsseldorf Central Station to Dortmund Central Station will take about 45 minutes to an hour depending on the train you catch. (I highly recommend breaking up the journey by stopping in Essen first!) From the station, you can reach the Dortmund Christmas market on foot within 10 minutes. You can easily check timetables on GoEuro or the DB website, but trains are frequent. Last but not least, this is a market I only learned about shortly after my whirlwind tour of Ruhr region Christmas markets, so I’m kicking myself for not seeing it in person! Nonetheless, I’ve included it in this list because this market is extremely unique thanks to an aerial stunt show that takes place every evening starring Santa himself and his own acrobatic angel. Every night, 35m above the market, tightrope artist Falko Traber dresses up as Santa Claus and dazzles the crowd by hovering and gliding above the Dr.-Ruer-Platz as a Christmas story is told. On weekends, he supposedly even slides down an 84m rope?! How could you NOT want to see this? 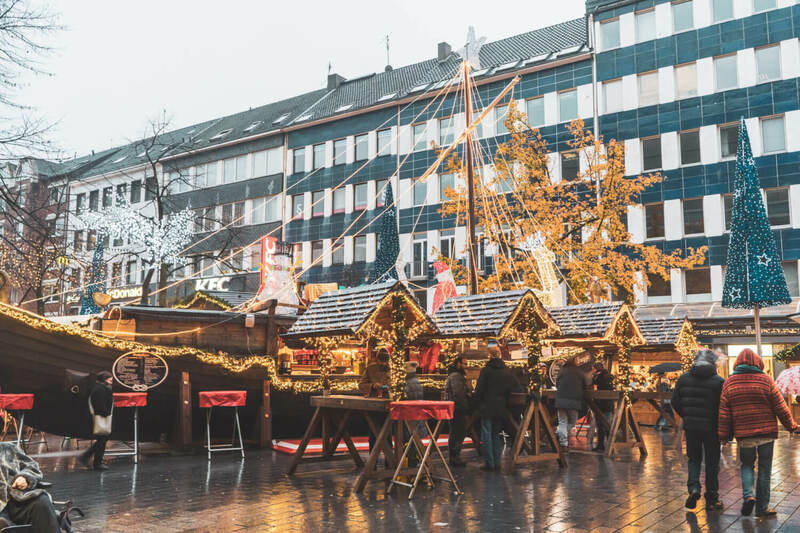 How to reach the Bochum Christmas Market from Düsseldorf: The trip from Düsseldorf Central Station to Bochum Central Station will take about 45 minutes. According to Google Maps, from the station, you can reach the Dortmund Christmas market on foot within 5 minutes. You can easily check timetables on GoEuro or the DB website, but trains are frequent. 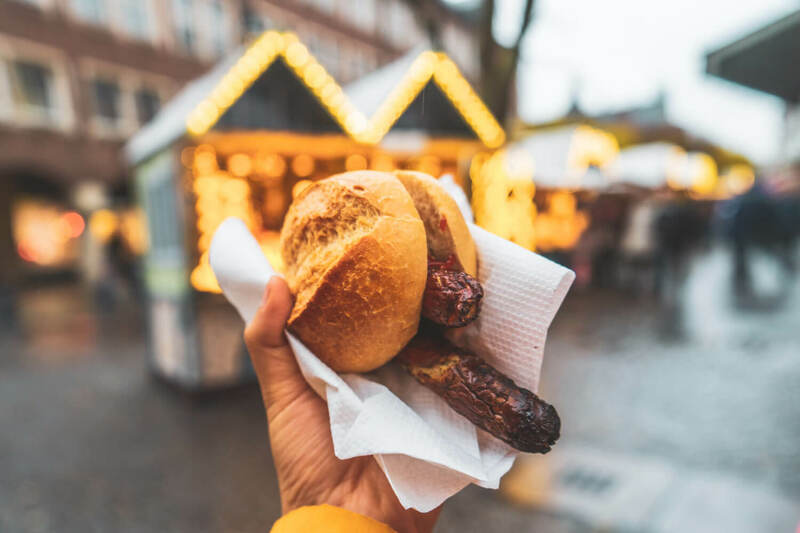 Here are a few highlights of things to eat while flouncing around Düsseldorf’s Christmas markets, but if you want a full list of must-trys, check out this post on delicious German Christmas Market food and drink. 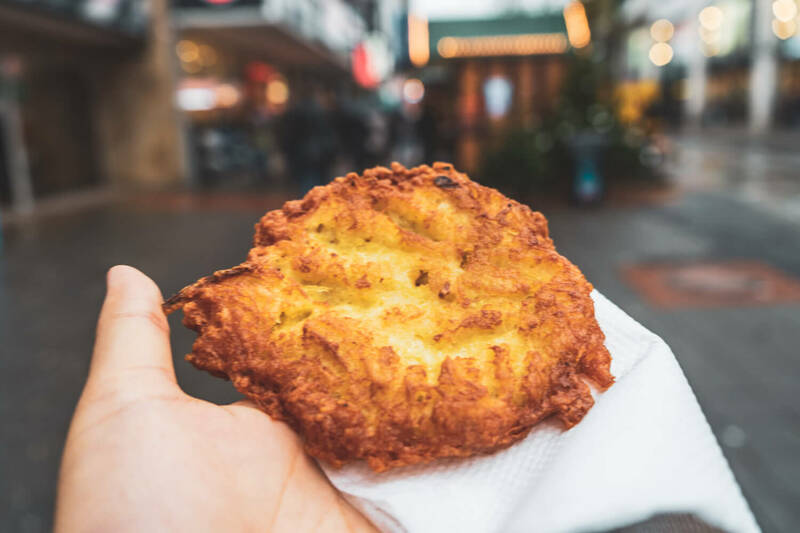 Whether you go for the cutesy name Kartoffelpuffer or the more aggressively German-sounding name Reibekuchen, these hashbrown-esque potato pancakes are a must try. They’re commonly served with some kind of applesauce, but they’re phenomenal plain too. Mulled wine, best consumed hot and scalding, whilst wistfully dreaming under twinkly lights. Addictive and delicious. They win in their simplicity (and their impossibly irresistible smell). Follow your nose and get some of these roasted almonds ASAP. A hot alcoholic drink made with egg yolks, white wine, spices (cinnamon & cloves), vanilla and citrus juice. It honestly tastes a lot like a liquid version of apple strudel….. but that may be owed to the huge topping of whipped cream it usually comes with. Frolic over to the closest Schwenkgrill (a dangling platform of grilling sausages mmmmgh) and grab yourself a bratwurst in a bun. When in Germany….. 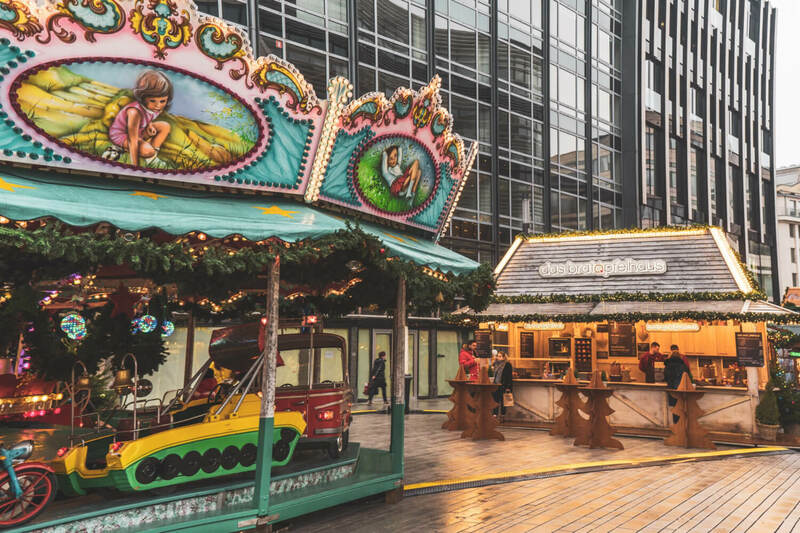 The Düsseldorf Christmas Market ice rink you might have seen in photos is located in Corneliusplatz, in the heart of the city. If you want a scenic place to go ice skating in Düsseldorf, this is it! Königsallee is well known as the swishy, high-end shopping street of Düsseldorf. If you’d like to be a total baller, this is the part of town where you might stock up on some sweet Hermes scarves or Louis Vuitton purses for your loved ones. For those of us who might prefer to spend our dollars on sweet treats instead, this is also a scenic little area for strolling and window shopping. Especially magical is the reflection of the “Dome of Lights” over the Stadtgraben. One of the centerpieces of Düsseldorf’s Christmas magic is its giant ferris wheel, aptly named “The Big Wheel”. With a strategically scenic position near the Rhine, this spot was one of my favourites in Düsseldorf. 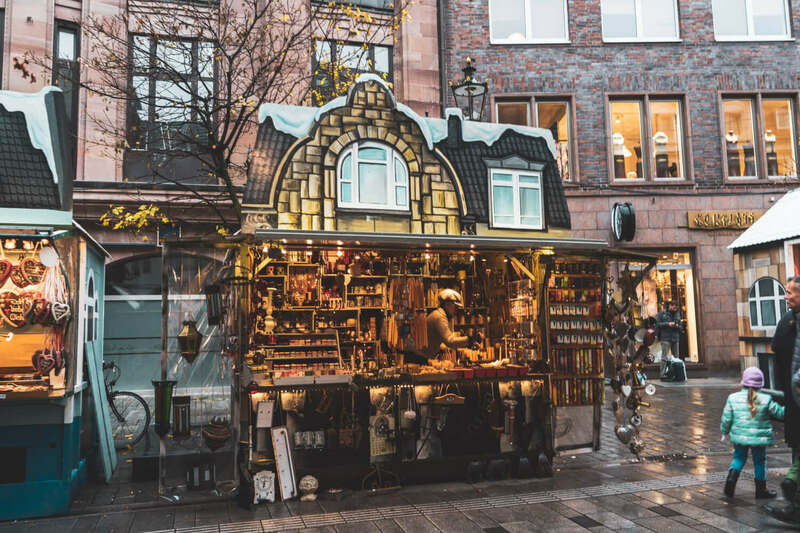 Surrounded by whimsical rides and a handful of cute, Disney-esque stalls, this area is a must-visit if you’re exploring Düsseldorf in December. As a Lindt chocolate addict, I need to recommend this store to you. It’s a beautiful, bright store in the middle of town, filled to the brim with delicious varieties of Lindt chocolate you never knew existed. You can mix and match the gorgeous selection into custom gift packs for your lucky loved ones, or simply come in for a look (and for the free sample that they give you on the way in. Shhh – you didn’t hear that from me). MY MUST-DO TIP: Get yourself a hot chocolate at the Lindt cafe (located in the store). We tried the milk chocolate and dark chocolate one – both were adequately life-changing. It wouldn’t be a Düsseldorf Xmas without some beer, am I right? You are still in Germany after all. 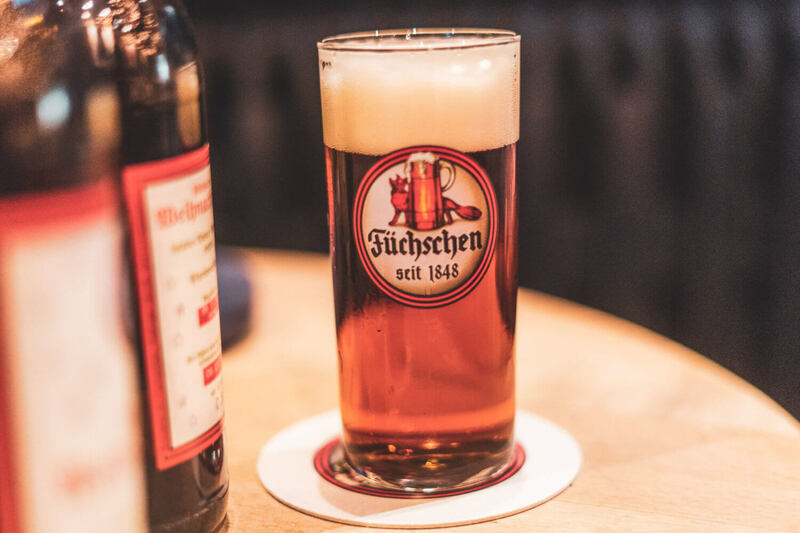 If your teeth grow wary of the endless Glühwein and candied almonds, then refresh yourself with a special Christmas beer over at the Brewery im Füchschen, a cozy brewery decked out in Christmas decor. There are a LOT of places to go shopping around Düsseldorf, a city with a flashy reputation as Germany’s fashion capital. 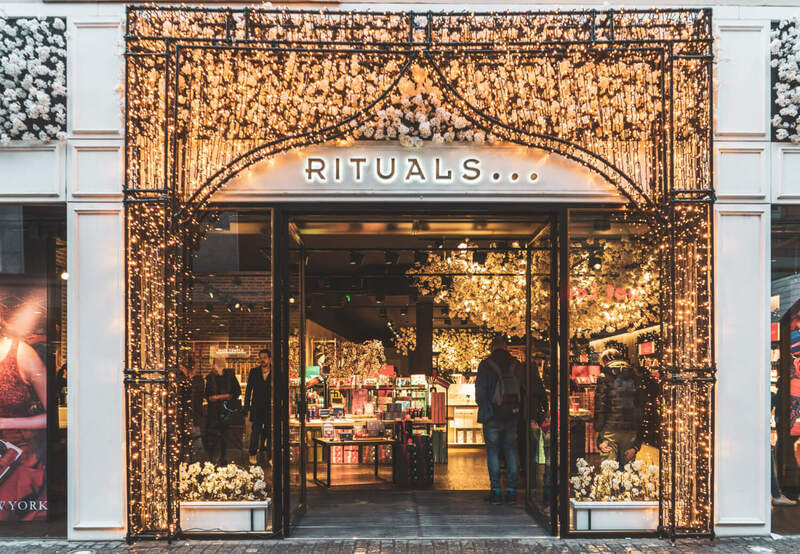 A lot of people from neighbouring cities and towns actually flock here to get their shopping done, so whether you’re looking for a big box department store, a well-heated mall or smaller, bespoke boutiques, there’s something for you to throw your moneys at. 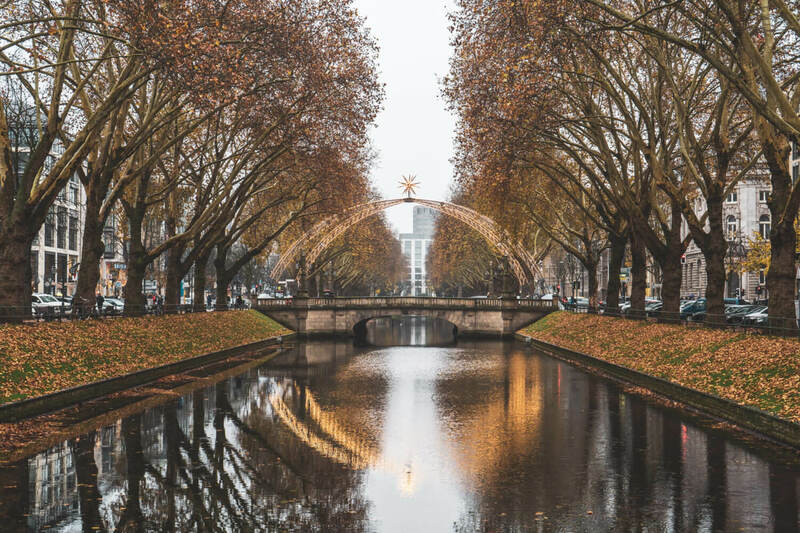 Last but not least, if you’re looking to spice up your visit to the Düsseldorf Christmas Markets, the tourism office offers a 2 hour guided tour that brings you on a festive stroll through the Old Town. Admission includes a biscuit and hot drink! Click here for details. 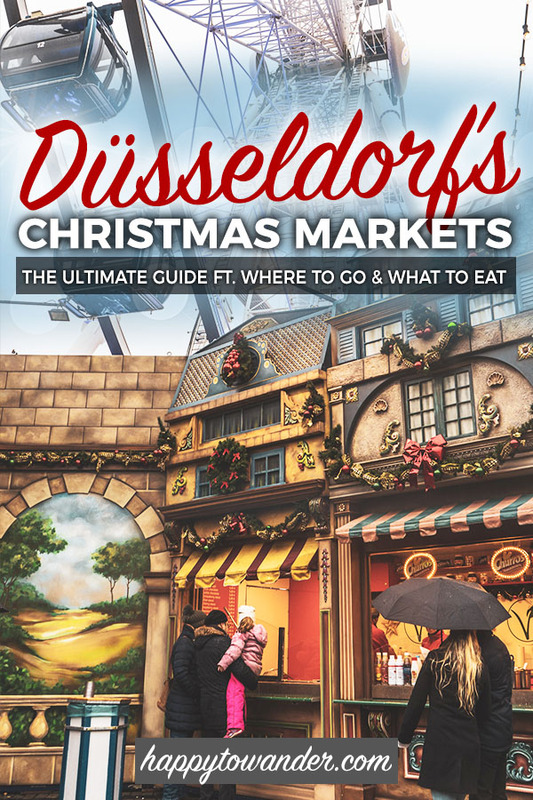 In case you’re hunting for a specific Düsseldorf Christmas Market location, click here to download an easy-to-use map that has starred all the main locations and the most wintery things to do in Düsseldorf. The second exception is Christmas Day. No markets will be open on Christmas day. In fact, this is usually quite a special time for Germans to spend with family so I wouldn’t expect too many restaurants to be open either. (Shops will definitely be closed as it’s a holiday). Be sure to research places to eat accordingly! This might seem a bit like a no-brainer, but night-time is really the time to be exploring Düsseldorf Christmas Markets! While all the photos throughout this post were taken during the day (I ran off to explore other nearby cities in the evening), know that these markets will be approximately 1.5 million times more magical after the sun sets and the city lights up. Again, I may sound like a broken record, but remember how close all these markets are to each other! Definitely try to hit them all if you can. I mean, I think I’ve talked long enough, but let me know if you have any more questions and I’ll get back to you in the comments. I ho ho hope you have the most magical Christmas in Düsseldorf, Germany! 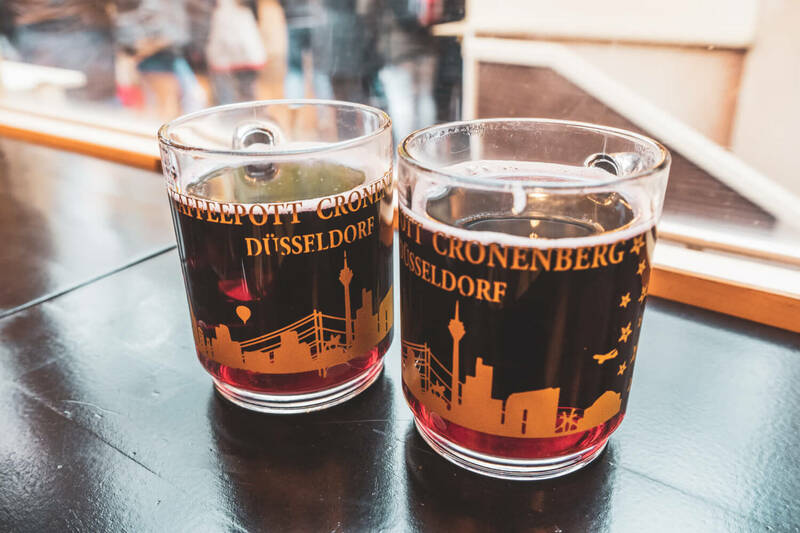 Previous ArticleNuremberg Christmas Market Guide: Where to Go, What to Eat & More!